Bullet-resistant glass is designed to look like the regular glass , while it provides much more resistance to breakage , The companies and high profile individuals choose to install the bullet-resistant windows in their homes , cars or places of business to increase the safety . Bullet-resistant glass is made of polycarbonate thermoplastic and laminated , tempered glass which absorbs the energy from the blows of the bullets , the axes , the bats or the other objects which are being used to break the glass , Due to their strength , making the staff and the customers feel safer . The term bullet-proof glass suggests a material that is 100% impenetrable to gunfire , It is actually not the case , No type of bulletproof glass can hold up forever against extremely powerful weapons that is why the term bullet resistant glass is preferred by those in the industry. The bullet-resistant glass has a range of applications , including the security and the military vehicles , the banks , the hospitals , the government buildings , the pharmacies , the police stations and Jails and it plays such a significant role in saving lives . Despite the name , Bullet-proof glass is not for stopping the bullets , The appropriately designed and installed bullet resistant window system is disaster-neutral , equally prepared to protect the people from the armed malcontents , the extreme weather , the industrial disasters and the other unforeseen cataclysms . The monolithic acrylic is used for lower-level bullet-proof windows , This material is extremely hard , In thick layers ( over 1.25 inches) it will deflect most pistol-caliber bullets–even under sustained fire , The pressure wave of the bomb blast or full-on impact of hurricane-flung debris will compromise these windows . The bullet resistant glass built around polycarbonate thermoplastic have much broader applications , Polycarbonate is more resilient than any other glazing material , Polycarbonate can absorb the tremendous impacts and the pressure waves without cracking . Without Polycarbonate layers , It is impossible to make the bullet resistant windows capable of stopping rounds from high powered rifles and submachine guns . Polycarbonate is a soft material , It swallows up the bullets and it sends them ricocheting at high speed , this lack of rigidity can make it tricky to work with and maintain . To take full advantage of Polycarbonate flexible resilience , It is laminated in the layers with the other materials , such as the acrylic or tempered glass and it is the key to creating ultra-resilient glass-clad polycarbonate . The bullet proof glass go beyond just stopping the bullets , It will also foil smash-and-grab burglars and angry mobs , deflect bomb blasts , and even protect against the earthquake damage and tornado-tossed bricks . The formulated and layered polycarbonate ballistic windows can possess more exotic properties , such as “one-way” ballistic characteristics and the fire resistance , You can see lives and property lost not just to the bombs and the bullets , but also to the raging wildfires , super-storms and civil unrest abroad . 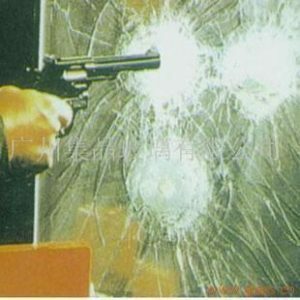 Bullet-resistant glass is much stronger than the regular glass , It can withstand a round of strikes from the bullets and the other objects , It increases the safety , It can be used to replace the windows in homes , businesses or the cars . The bullet resistant glass is used for years in the financial institutions , It is designed to prevent the bullets from passing through an exterior wall into the interior , while allowing the bullets to pass from the interior to exterior . It is not the thickness that makes the glass bullet resistant , As the bullet resistant glass has multiple layers of materials designed to absorb the shots , So , the impact will spread over a larger surface area and the bullet is slowed down before it can penetrate the glass . The bullet-proof glass improves the safety in the work environment , Staff at counters can lock the doors and feel completely secure , These can make it more difficult for the burglars trying to access your property once everyone has gone home . Bullet-resistant glass is used for banking institutions and jewelry stores , any company that stores high value goods that appeal to the burglars , It can reduce the theft risk and keeping the staff and the customers safe . Due to the durability of this material , The rocks , the stones , the bullets and the other heavy objects won’t get into the premises when bashed on the glass , The gunman can stand and fire a shot directly at the doors without compromising the people inside ,This is a huge advantage to high risk businesses . Bullet-resistant glass is exceptionally appealing , It is used by high risk businesses throughout the world , It can eventually break with the repeated impact , It is more difficult to cut and reduce the size . Bulletproof glass is more expensive than the regular glass , It can be costly and sometimes too pricey as it can add a couple of thousands more to your construction project , but it will eventually reduce your insurance costs . As the bullet proof glass doors are thicker than the average glass material and offer the added security you would expect from this material , So , the price is inflated . The bullet resistant glass weighs significantly more than the standard glass , and when used in the security vehicles , additional motors need to be installed to move the windows up and down . You should not purchase your doors from any company , Always do some research to ensure the company can supply , install and repair them if necessary , This means you only have one company to call when you need repairs or installation done . You have to check to see if the glass companies you are thinking of has the necessary licenses and insurance in place , Always check to determine if they offer an emergency service .